Greg Renoff’s “Van Halen Rising” charts the early triumphs, mishaps and wildness of the band that saved heavy metal. I’m a sucker for epic stories of people from diverse backgrounds coming together for a common cause and setting off on a journey that not only changes their lives, but changes the world. Think The Lord of the Rings, Star Wars or James Ellroy’s L.A. Confidential. I also love the origin stories of super heroes, how normal men achieve greatness through unbelievable talents. Sometimes these heroes even band together to form a super group and write their own epic tales. If you’re like me and find a thrill in reading about such things, then Greg Renoff has written the kind of book you’ll love. The heroes in this book come from the rugged wilderness of Southern California in the 1970s, where yacht rock and disco were slowly sucking the life out of hard rock and heavy metal. Two immigrant brothers – one a drum virtuoso and the other a guitarist whose fingers were gifts from the heavens, join forces with a showboating son of an eye doctor and a bass player with the voice of a God to become the backyard party band that, as Renoff states, saved heavy metal. Van Halen Rising is a thorough documentation of the birth of Van Halen, the multi-platinum act that rose from humble beginnings to go on and sell out arenas, survive multiple band lineups and addictions, and eventually get enshrined in the Rock and Roll Hall of Fame. Renoff digs deep in his research, through extensive interviews with the people present during their rise to fame, including major players like former bass player Michael Anthony, engineer Donn Landee and producer Ted Templeman, as well as combing through decades of interviews with Alex and Eddie Van Halen and David Lee Roth, as well as Roth’s own memoir. The book begins with Eddie and Alex Van Halen arriving in Pasadena, CA from Holland in the early 1960s and forming an unbreakable bond as they tried to navigate a new country and language. Early music lessons gave way to the boys discovering rock ‘n roll and deciding that that was a life they wanted to live. By the early 70s, the brothers had formed a popular party band that went through several names until settling on Mammoth. Along with bass player Mark Stone, they built a reputation as music virtuosos, even if Eddie, on lead vocals, howled more than singing. One of their admirers was a flamboyant wild man determined to become the world’s greatest entertainer. As soon as he saw Mammoth play, David Lee Roth wanted to be their front man. A series of failed auditions prevented him from joining the band, so he formed his own. While Mammoth grew in popularity, Roth’s group, Red Ball Jet, struggled to get any credibility. They weren’t very good, and Roth showboated more than singing in tune. Still, they managed to land gigs thanks to Roth’s father’s support. After a disastrous audition at a Vegas joint, Red Ball Jet fizzled out and Roth attempted to become a solo artist. In 1973, Eddie grew weary of singing and wanted to focus on redefining his guitar skills. At the same time, Mammoth, who for a brief period now included a keyboard player, realized they needed a regular P.A. system to haul to their shows. Roth owned his own P.A. and he began renting the equipment to Mammoth. Through this in with the guys, he eventually persuaded them into believing that what Mammoth needed to take the next step was a singer out front who bantered with the crowd and let Ed, Alex and Stone all do their thing. Eddie agreed, and hired Roth, but only after his first choice passed. After receiving a cease-and-desist notice from another band called Mammoth, the foursome changed the name of the band to Van Halen. Despite some longtime fans getting pissed that Roth was now the lead singer, and the keyboard player hating Roth and quitting, Van Halen grew more popular and started working clubs. The final piece of the puzzle arrived in 1974 in the form of Michael Anthony, who was the bassist and lead singer of another So Cal band. Stone had worn out his welcome with his penchant for getting stoned and perpetual tardiness. Eddie questioned his dedication to Van Halen and after hearing and seeing Anthony play, Stone was out and Anthony was in. The classic lineup of the band was in place. From there, Van Halen’s ascension to rock saviors moved quickly. They landed a gig opening for the major label band, U.F.O. and blew the headliner off of the stage. Gene Simmons of KISS tried to manage the group and helped them record a demo, but to no avail. To Simmons credit, the notorious businessman tore up his contract with Van Halen when he had to go on tour so that they could continue looking for a record contract, Finally, Ted Templeman, renowned producer known for his work with the Doobie Brothers, Little Feat, Van Morrison and, Montrose, another hard rocking band with a killer guitarist (and whose lead singer happened to be future VH frontman Sammy Hagar), witnessed Van Halen live and signed the band to Warner Brothers just to work with Eddie. He produces their first album and the rest is music history. Renoff writes in a thoughtful and conversational voice, one you might hear while talking to one of your buds while listening to the first VH album. You know there’s always someone one who knows everything about music, and Renoff seems to be that guy. But he doesn’t talk down to you, as if he’s a know-it-all. Instead, he simply shares this little known tale of Van Halen with enthusiasm and a fair and balanced approach to his subjects. Not only is Van Halen Rising well organized and researched, and at times it’s also laugh out loud funny. The stories of Roth’s first attempts at being a lead singer are classic. Hollywood producers should take note, as well, as there is enough great material here to make for one hell of of movie. With the success of Straight Outta Compton, and Martin Scorsese’s look at the 70s music business gearing up for early 2016, you combine the two and you have Van Halen Rising, a tale of four guys with different talents who come together and bring out the best in each other, as they go on to change the face of heavy metal and rock ‘n roll. Whether you like Van Halen, heavy metal or rock music in general, this is a great read. 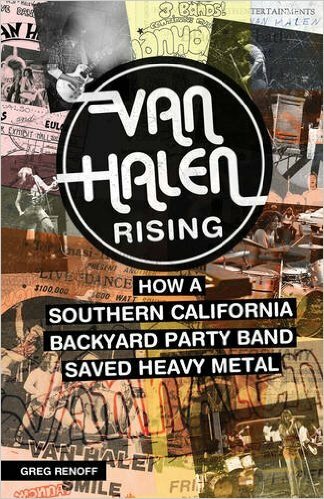 Van Halen Rising: How A Southern California Backyard Party Band Saved Heavy Metal (2015, 372 pages, ECW Press) is available through Amazon.